The gambling industry itself is no stranger to disruption of course. Since 1994, we have witnessed the mass adoption of online gambling platforms which enable users to place a bet from the comfort of their own homes rather than having to venture out to gamble in the middle of the night in a shady part of town. Now even those online gambling platforms are being disrupted by the emergence of decentralized casino platforms based on blockchain and smart contract technology. We are being invited into a new world of ‘trustless’ gambling and the chance to play our favorite Ethereum gambling games on decentralized applications publicly auditable on the blockchain. As Bitcoin has been around for more than ten years, it has had a clear head start on Ethereum gambling in terms of developing its eco-system for crypto gamblers. In fact, casino platforms were some of the first applications to be developed for Bitcoin users and at present, there are a far greater amount of choice to gamble with Bitcoin than Ethereum. Bitcoin has had time to meet the demand for user anonymity and provide a number gambling platforms that accept the cryptocurrency as deposits and for withdrawals. Undoubtedly, the level of anonymity provided by Bitcoin gambling platforms is unparalleled and has improved upon any payment system that has gone before. Bitcoin casinos allow players to sign up without the need for an email address or any other means of identity verification. When compared to the requirements of ‘regular’ gambling platforms which require users to provide scanned copies of photo IDs and utility bills, it’s not difficult to understand why the shift has occurred. One of the main factors which has led to the disruption is the lack of trust that permeates the culture. The problems affecting users are numerous, and include the risk of fraudulent activity, hidden fees, high cost of entry, access to funds and withdrawal delays. Not to mention the fact that these platforms are hosted privately in a physical center on a data server, which presents a risk of malicious coding and abuse of customer data. One of the main benefits offered by Bitcoin casinos is that they have provided a level of transparency to their operations and instill gamblers with a sense of trust and security that they have been so desperately longing for. The unscrupulous conduct that was so prevalent with online gambling in the past, has been in large part mitigated by the cryptocurrency. The process of buying Bitcoin is still easier than buying Ether. If you would like to get your hands on some Ether, it generally means that you must first purchase Bitcoin and then exchange the cryptocurrencies. Furthermore, there are still many more online casinos accepting Bitcoin than Ether with best option for gambling using Ether being Betcoin, which offers a wide variety of games. Gambling with Ether still remains quite young in comparison, although this is changing. There has been a sharp increase in the number of online gamblers seeking to win Ether and a number of casino faucets allowing players to earn Ether have emerged such as Cryptogames, Smart Roulette and Bitsler. Are smart contract casinos the future of crypto gambling? 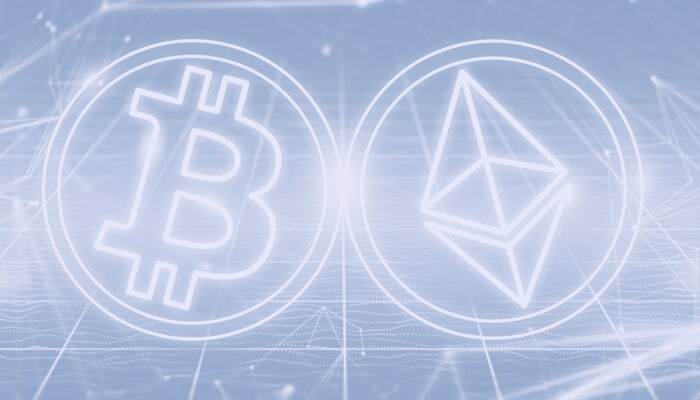 Despite Bitcoin’s recent dominance in the crypto gambling industry, the current buzz concerns the application of Ethereum’s technology to online gambling solutions. Many industry insiders expect Ethereum gambling to completely overhaul open-source development in online gambling and predict that its smart contract functionality will ultimately revolutionize online gambling. Ethereum has brought smart contracts into the world’s consciousness by building-in the functionality into its protocol. Essentially, smart contracts offer users the ability to move value from one wallet to another via a series of programmed functions negating the need for third-party oversight of the exchange. Smart contracts also allow for decentralized applications (DApps) to be built on top on its platform. ‘Casino DApps’ have many advantages over traditional online casinos – one of the most obvious benefits is the increased speed of payment processing. But the advantages do not stop there – they also reduce cost of entry and improve the security and integrity of the platform. The beauty of a smart contract is that the code is publicly auditable which enables all potential users to validate it before they engage with it. Ethereum provides online gamblers with the much-needed transparency they require in order to securely place bets whilst simultaneously lowering the operating costs for developers. These savings can be ultimately passed on to the users by softening the house edge. Another benefit users enjoy is that all betting is paid directly to the smart contract and any winnings are paid immediately back into users’ wallets without any third-party oversight. As bets made are publicly auditable on the blockchain, there is minimal chance of a non-payout on a winning bet. It’s not all a bed of roses with smart contracts however and like with all new technology, there still is a level of risk associated with them. The major risk is that the code has been poorly written by the developers. It is important for users to perform their due diligence and make sure the platforms they are using have been audited by an online security professional before depositing any funds. Regardless of any particular platform having the danger of having poorly written code, players should always mitigate their risk with newer established platforms by only wagering small amounts of Bitcoin and Ether. Thankfully, this is made easy due to the incredibly small amounts that cryptocurrencies allow gamblers to bet with. It is important to note that the majority of Ethereum gambling sites that accept Ether do not actually operate using smart contract technology. Many of these platforms merely allow Ether to be used in order to deposit or withdraw account funds in the same way as Bitcoin gambling sites currently do. Most of those casino platforms accepting Ether as payments are still running their platforms on private servers and not on decentralized platforms offering the integrity and security mentioned above. In a market that has become dominated by Bitcoin, smart contract casinos are eyeing a slice of the market. Smart contract technology is of much interest to online casinos and a number are started operating in 2017 or are in the pipeline for 2018 such as Edgeless. One of the recent movers and shakers in the smart contract gambling space is a Russian-based project named DAO.Casino which is building a completely decentralized platform for online gambling games. Its ecosystem intends to reward developers or players for participating in the platform and uses Ethereum to distribute funds according to the value they contribute to the project. DAO.Casino’s developers assert that the platform will further protect users from the typical security issues that traditional fiat currency platforms been blighted with. However, despite such well-intentioned ambitions, DAO.Casino must of course still go through a licensing process which ultimately entails approval from regulators which as we have become to know, is no easy feat. With online gambling representing a thriving industry and worth a reported $46 billion, it is foreseeable that the clear advantages that smart contract offer online gamblers will mean that Casino DApps will become the preferred way of gambling in future. However, we are still in the early stages of adoption, so whilst gambling with Bitcoin remains the conventional and safer choice at the moment, we expect Ethereum-based smart contract casinos to catch up very soon. To get an expert insight in the state of Ethereum based gambling please refer to out latest article that gives a complete run-down of the state of Ethereum Gambling in Mind 2018.